JACKSON, Miss. 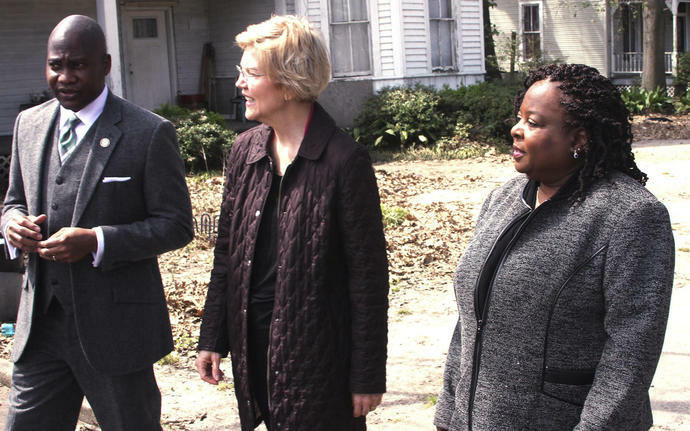 (AP) - Democratic presidential candidate Elizabeth Warren on Monday embraced a congressional proposal to study a framework for reparations to African-Americans hurt by the legacy of slavery as the best way to begin a "national, full-blown conversation" on the issue. Warren offered in-depth answers to several other questions that touched on issues important to African-American communities, winning cheers for a call for Mississippi to replace its state flag - the only one in the nation that depicts a Confederate image. Warren, 69, has made racial justice a centerpiece of her case for the Democratic nomination, even as she doubles down on her long-running emphasis on economic inequity. She has been critical of the electoral college in the past, saying last year that Trump's 2016 victory - despite Democrat Hillary Clinton's winning 3 million more total votes - is "not exactly the sign of a healthy democracy." But Warren's comments on Monday were her most straightforward endorsement of an end to the electoral college system.